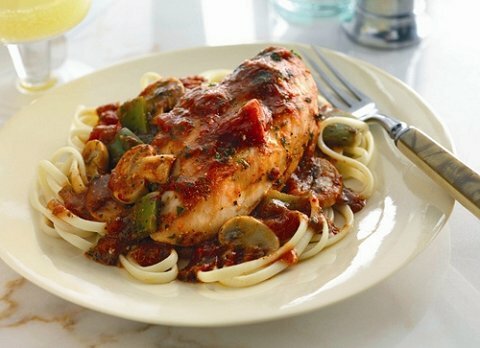 Chicken cacciatore. The word cacciatore is the Italian word for hunter and this dish refers to the food prepared hunter style. This is the basic recipe but we decided to add some more ingredients for a recipe that was more suitable to our families desires and taste. So here is the basic recipe. Place the chicken in the slow cooker and top with all of the rest of the ingredients. Cover and cook on low heat for 8 hours. So that is the basic recipe. Now here is the families recipe. Directions the same as above. 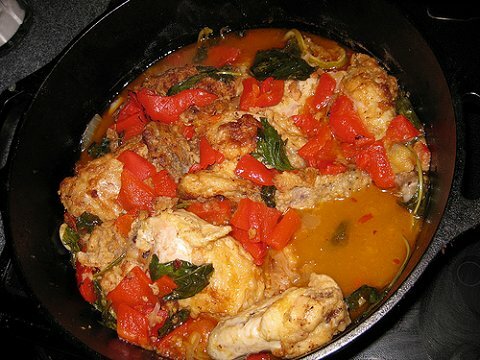 Here is another tasty Crockpot Chicken Cacciatore recipe that is low in fat and sodium. Place everything in the crockpot except the cornstarch and water, cover it and cook on low for 7 to 8 hours until the chicken is completely cooked. For a thicker sauce, combine the cornstarch and water and mix thoroughly. Stir into the covered crockpot and cook on low for 20 minutes. Serve with hot cooked pasta for a real delight. Chicken recipes are so easy to put together. Oven baked whole chicken, chicken and noodles recipe, and chicken enchilada casserole and yes, even chicken thigh recipes go over wonderfully around our house. We sort of draw the line at chicken wing recipe as they are skimpy and rarely have much meat on them.